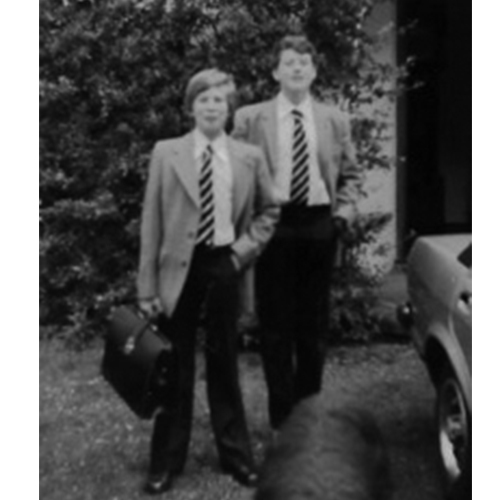 Steve (left) at age 13, with his older brother, briefcase in hand, ready to start at his second boarding school. It is a school where rote learning is standard; where good study habits mean copying pages off the board verbatim; where the art teacher gets angry if the boy doesn’t do it her way; where he is told to stand facing the wall for two hours after getting caught talking after lights out; where he must wear shorts even on the most biting of winter days; where no one knows his first name, only his last; where bullying is regarded as an acceptable form of character building; where missing chapel results in a beating; where untrained teachers rely on the pedagogy of their own post-war school experiences. The small and sensitive seven year old has no opportunity to find out who he is. He simply hides himself away. That same April 1975. Seven thousand miles away, at a small school attached to Montview Church in Denver, Colorado. A teacher, trained in that same post-war England, is watching and listening to children. They are just returning from spring break. The sun warms their faces. All around her there is joy and laughter. A few of the children are seven, small, and sensitive. These children, however, are painting glorious pictures; they are pouring water and digging in the sand; they are reading and writing – anything they want; they are sewing, building and gluing; they are playing dress-up and make-believe; they are learning math with blocks and color; they are learning how to give and take and share; they are celebrating each other’s successes; they are hugging and being hugged. The English woman does everything in her power to help these seven year olds find out who they are. And they sparkle. The teacher’s name is Carolyn Hambidge. She has recently arrived in Colorado, from England, with a young family of her own. She is in the process, although she doesn’t know it at present, of founding a school that would later grow into a beloved institution, educating thousands of children. All of them touched personally by her strong principles, her guiding hand, and her love. The boy’s first name is Steve. Me. Everyone calls me that now, even my students. Fifteen years after those humble beginnings, I stumbled upon Carolyn’s school. She hired me and I have learned. I was a teacher and theatre director at her school for twenty years, the length of a childhood. Her school, now known as the Stanley British Primary School, has taught me well. A few years ago, I moved on from Stanley and came to a place called Friends’ School in Boulder, Colorado. Friends’ is not a Quaker School, though it shares similar values. It was named by the first children who attended – it’s where their friends went to school, where they learned to make friends. Both of these school are magical places for children. I am proud of the joy to be found. Children feel safe, knowing there are clearly defined limits and high expectations. They are free to be themselves, to explore while learning, and to find success. They are encouraged to take risks and they are guided as they learn from their mistakes. We work together to find out more each day about what kind of learners they are. They learn to articulate their strengths and they work to strengthen their weaknesses. They learn how to be mindful and kind. They know they can make a positive difference in numerous ways. They are supported, trusted and loved. They are on the pathway to discover who they are. Friends’ and Stanley are schools where children are encouraged to reach outside their comfort zone, to strive for something they did not know they had inside them. Humour and delight abound. My colleages and students at these two schools have taught me how to watch and listen to children. They have taught me what a joyful place school can be. They has shown me that the process is more important than the product. They have helped me understand what it means to be a lifelong learner. They have surrounded me with color and creativity, laughter and friendships. While my formal schooling in England taught me dates and facts, Latin and Greek, competition and one-upmanship, there was so much I did not learn. I never learned about support, justice, cooperation or trust. I never learned joy, gratitude or love. I never learned the importance of play. I have learned these things at Stanley British Primary School and at Friends’ School. I have learned them from Carolyn, from colleagues, and from parents. But most of all, I have learned them from the children. I watch them and listen to them and they teach me. I now know that I did not stumble upon Carolyn’s school. I was guided there for a reason. It is my mission, my life’s passion, to share this work with you. I am dedicated to working with educators and parents who want to help schools become more joyous, creative, child-centered places. I am here to support schools that are looking to find meaningful ways to incorporate ideas and curricula that foster growth and learning, that nurture respect, responsibility and risk-taking. I am here to work with teachers who want their students to make meaningful choices and to create a clear path to discover who they are.